Update: As predicted, the brain drain has begun with executives leaving and others questioning Zuckerberg’s leadership ability. 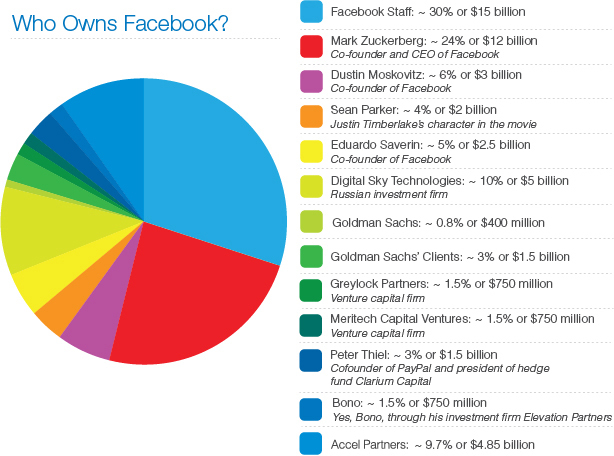 As we all know, Facebook will go public in a huge IPO. This will create many mega-millionaires overnight who work there. I wonder what the drain in human intellectual property will be when they don’t have to work like maniacs anymore. Most people work only because they get paid. A common cliche is that work is a 4 letter word. Otherwise, they wouldn’t put up with the job they have, proven by frequent job shifts over a lifetime. They leave for a better opportunity, or a bigger paycheck. My observation (not scientific) is that if the paycheck wasn’t a part of the deal, the job wouldn’t get done. Then there are a few who really like to work like my Dad. His life was his work (HVAC engineer) and he loved it. My uncle was a pilot who also loved his job. Both regretted their retirement. Finally, there are a few who love what they do because it is their passion. It has been said that if you do what you really love, it isn’t work. These are usually the most successful people. When Facebook goes public and there will be a group of people created who are the overnight millionaires, many will move on. Some of them are the creative minds behind what has made the company the success it has been. Sure you can hire more programmers and throw options at them, but they are in the category of working for a paycheck. Many won’t have the need (some the desire) to work. I watched many friends I had at Amazon become millionaires and quit. They went on to do what they wanted to because they sold stock and had the money to do so. The people that lived and breathed the Facebook that we know it have and hold the history and the reason that it is what it is today. That knowledge can’t be replaced. What will be the brain drain at Facebook? I’m sure there are loyal employees who will stay. The executives will likely stay because they already are rich and at that point it is a matter of power, not money. Others, I’m not so sure. Insiders and early Facebook investors are taking advantage of increasing investor demand and selling more of their stock in the company’s initial public offering, the company said Wednesday. Facebook said in a regulatory filing that 84 million shares, worth up to $3.2 billion, are being added to what’s shaping up to be the decade’s hottest IPO. Facebook’s stock is expected to begin trading on the Nasdaq Stock Market on Friday under the ticker symbol “FB”. The entire increase comes from insiders and early investors, so the company won’t benefit from the additional sales. Even the Motley Fool is predicting investors will get burned. Recently, it was stated that Facebook could be a passing fad. This fact is not lost on those looking to make a killing. If you recall Palm, Friendster, Sony Walkmans and other technologies, or beanie babies and tickle me Elmo’s, fads come and go quickly. As Qui-Gon Jin said: There is always a bigger fish. This means the next bigger and better Social Network or better idea is already being worked on. Innovation drives technology and history has proven it…..ask 3com, Wang, Digital or many others. We already know that they economy is still in a recession and cash is king. If this IPO is anything like Groupon, it will trend high, then the price will go down and people want the most bang for their buck. I know I’d dump it all and diversify by day 2. I can’t comment as to whether I’d quit as I don’t know the culture, but I’ve worked for paranoid owners before and I know that it is a tough environment. Zuckerberg has publicly stated that it’s good to be paranoid. If that was the case, this is the time to bail. It’s no secret that Facebook is not fully baked on their mobile strategy or execution yet either. That is a pretty large faux pas. Worst of all, millions are choosing to not be on Facebook or are just saying no to it. Many of these are in the high wealth category. So how much brain drain and personnel IP will leave? Time will tell, but I’m sure there are a lot of folks contemplating this issue as I write. The pressure of work, making a killing on stock or losing a fortune takes its toll on the workers. I had a lot of friends at Cisco when they were flying high in the market. While others played solitaire at the other technology companies, Cisco employees spent half their day watching the stock price to see how high it would go and calculate how rich they were. The problem was that they weren’t vested. I hope that Zuckerberg and lawyers are smart enough to make their employee options at least 3-5 years before they are fully vested to keep the best and brightest there. Still, some might be mailing it in until year 3 while dreaming of being rich. My final comment on the greatest brain drain comes in the form of 2 people, Paul Allan and Steve Wozniak. They got out and went on to different lives, but I’m not sure they still held the passion they had while building their company’s.